it begins with the protagonist, Sebastian, being hired for a job he doesn’t quite remember having applied for. he takes a ferry to his new home and lands in the city where the rest of the story takes place, …and that’s about as far in as i could get without wandering around aimlessly. unfortunately for the coherence of this game, wandering around aimlessly will slowly hand you the tools to break everything. 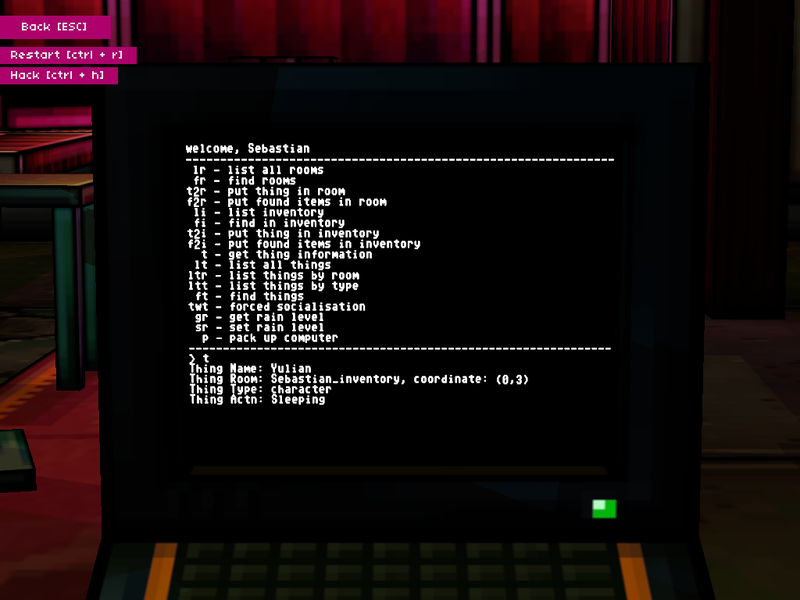 i discovered a computer with the ability to remotely unlock doors, out of curiosity, unlocked all the others in the hotel where Sebastian was staying, discovered a “Modifier” (the tool which allows the game’s characters to edit the programs controlling devices, and things quickly devolved from there. i figured out how to make a skeleton key to bruteforce attack and unlock any door, stumbled across another Modifier, found that editing a Modifier with a Modifier can remove the limitations initially placed on it, making editing the destinations doors connect to possible, stumbled into a room called Testing which, among other things, contained a couple of teleportation devices, found an extractor which could get the names of things, found a taser while running around the evil corporation’s main building, located a room housing a “god computer”, called the MainFrame, which could manipulate any object anywhere, found a hackish way of using it to move things to different rooms, wrote a program for another computer connecting to the MainFrame which made all this portable and convenient (using the hackish move-objects functionality to move it to Sebastian’s inventory when done, which looks a bit silly because computers are meant to be static objects that he can’t pick up), wrote a function for case-insensitive searching, located a computer called Heart, moved it to Sebastian’s inventory, typed Break() into it and compiled… and a couple of minutes later a swarm of dudes in suits showed up, some lady tased Sebastian to death, and the credits rolled. i loaded a save before Break()ing everything and decided to try playing through the story, but discovered it wouldn’t be easy. the tasks presented to Sebastian were annoyingly simple, but wandering around discovering things by chance had already made a huge mess of the game world (doors going nowhere or connected to each other in infinite loops, objects missing from their original locations because i’d already collected them, apartments with all their normal items removed and replaced with toilets, trams moving at randomised speeds, a credit card that wouldn’t stop beeping forever and ever because i’d set it to double Sebastian’s account every time he checked its balance and then checked too many times, and even a couple of characters stuck in Sebastian’s inventory (which has several hard-written blocks against it in the games source somewhere, so accomplishing it was very difficult and taking them out afterwards was impossible).